Joseph wakes up suddenly and realizes he doesn't know who he is or where he lives. He does, however, have a very strong feeling that he has a wife and he needs to get to her and their home. Will, just seventeen years old, sees Joseph and feels the need to help him. So he offers to drive Joseph around to see if they encounter anything that looks familiar. At the same time, Warren, who is recently unemployed and going through a divorce, spends his days visiting his mother at an assisted living facility. His mother's health is deteriorating, so he begins cooking all the wonderful meals she used to make, hoping to bring her back to him. What he doesn't know, though, is that his mother, Antoinette, just wants to lie in bed and dream that she is back with her husband, Don, living through all the wonderful memories they shared together. In The Journey Home, Michael Baron takes the reader on a journey along with his characters as they each try to find a place where they feel at home, where they are happy and fulfilled. At only 176 small pages, this is a very short, quick read. There's not a lot of action or excitement, like many of the books I read. But the characters are where Baron gets me. If you've read my other reviews, you'll know that my favorite books are ones where I feel for the characters. 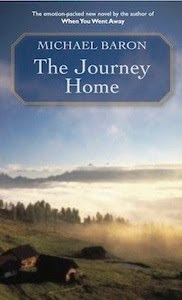 Baron does a wonderful job with characterization in The Journey Home, and in his other book I read, Crossing the Bridge. I felt the desires of each character, their pains and needs for making it to the place where they were going. I also love how Baron makes the interactions and actions of his characters seem so natural and realistic. I will say that even though this is a short novel, there were times when I felt like it was a little slow. But since it's so short, that feeling didn't last long. Perhaps I was just anxious to know what was going to happen with everyone. I loved the way Baron tied everything up at the end. The ending of this book made me feel at peace, content with the way things ended up for everyone in the story. That's a nice feeling to have when you put down a book for the last time. This review was written based on a copy of The Journey Home that I received from The Story Plant. I have this book for review also...after reading your review I can't wait to read it.